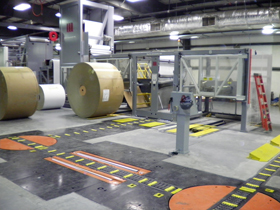 Track systems can be configured for your needs with a full line of accessories to rotate, lift and square, strip/prep roll and present the roll to your unwind stand. In floor kickers allow floor level traffic when not in use. They raise and extend out of the floor for kicking rolls from track. 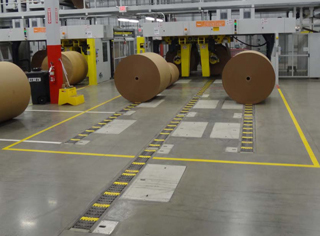 Roll preparation station allows for the roll to be stripped of wrapping and prepared for loading into the unwinds. Lift and square stations can be inserted in the system as shown in chucking area, or outside the chucking area along the track length. The roll positioning ramps are used to assist in placing a roll onto the track and come in many different styles. 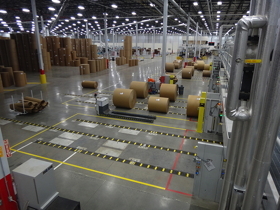 The roll orientation turntables are used to rotate the rolls for delivery to the unwind and to correctly deliver the rolls in the required unwind orientation for the unwind operation. Load capacity up to 24,000 lbs.